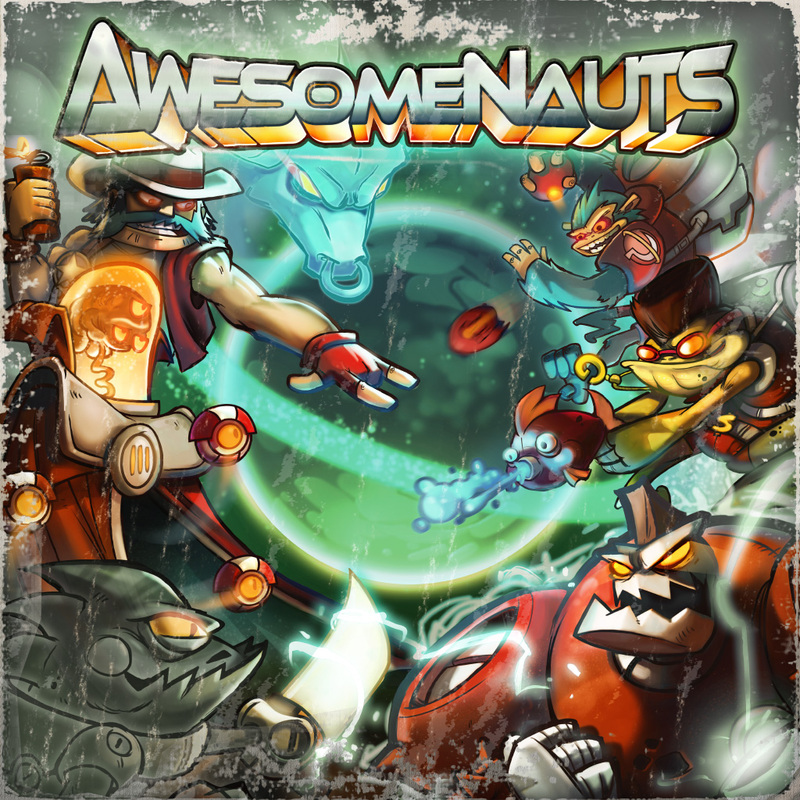 From the moment Awesomenauts loads up, you can’t help but be won over by it’s 80’s themed graphics and soundtrack. From the game’s intro music (complete with cheesy guitar riff) to its achievement list that draws reference to Teenage Mutant Ninja Turtles, He-Man, Transformers and many more, the game looks and feels like a Saturday morning cartoon that never was. Peel back the cute and fun exterior, however, and you’ll find a 3 vs. 3 MOBA with a deceptively deep unlock and ranking system. Drawing influence from Defence of the Ancients, each match is played out like an inverse tug-of-war, as two teams of three try to fight their way to their opponent's base, or drill core in this case, which is located on the opposite side of the map to where you spawn. Separating either side are a varying number of large turrets that can not be passed without being destroyed. It's not a simple task of shooting them a few times though; each turret can not only withstand a large amount of damage, but it can also dish it out, killing any player foolish enough to stand in its firing range for too long. Assisting each team are AI controlled droids, small characters that spawn in pairs throughout the match at regular intervals. The droids not only cause small amounts of damage to enemies and their defences, they also act as a shield/distraction, taking the brunt of the enemy turrets' firepower, leaving you a small window of opportunity to get a few well timed shots in. Before each match, you’ll be given the choice of the six beautifully animated characters with which to fight, although you had better be quick choosing your favourite — you can only have one of any specific character on your team. Similar to choosing a class in a first person shooter, each character provides you with both advantages and disadvantages in battle. The Hulk-like robot “Clunk” can soak up more damage than other characters, but is slow to move around the map. “Voltar the Omniscient” can heal teammates, but offers very little in defence. Each character has its own unique dialogue that at times can be very amusing, including a taunt that you can use on opposing players. The dialogue can become a little tiresome during the course of longer matches but, to be honest, if you've got enough time to pay attention to it, you're not playing the game properly. 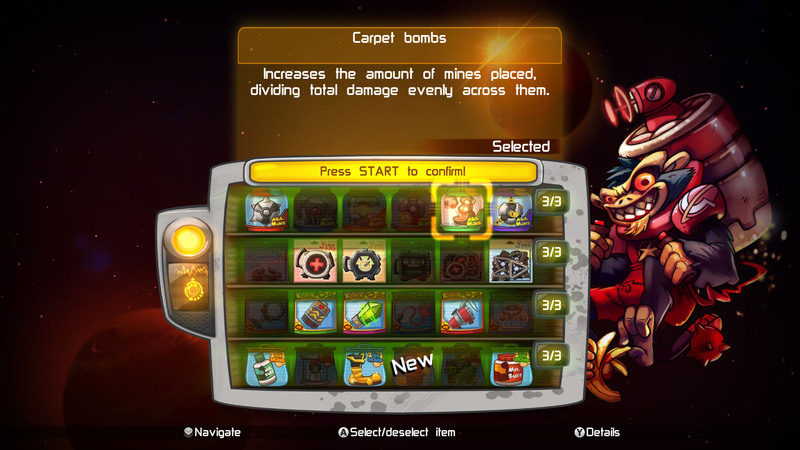 In addition to the varying classes, the game also offers large customisation options, with new upgrades and abilities rewarded as you progress through the ranks. The abilities and upgrades you choose to add to your load out aren’t immediately available to you at the start of the match, however; they need to be purchased using Solar - the in-game currency - from the shop located at your base. Solar can be earned by killing enemies and destroying turrets, or it can also be collected at various points throughout the map that respawn over time. The more Solar you manage to collect and the longer you stay alive, the more upgrades you can add to your character. 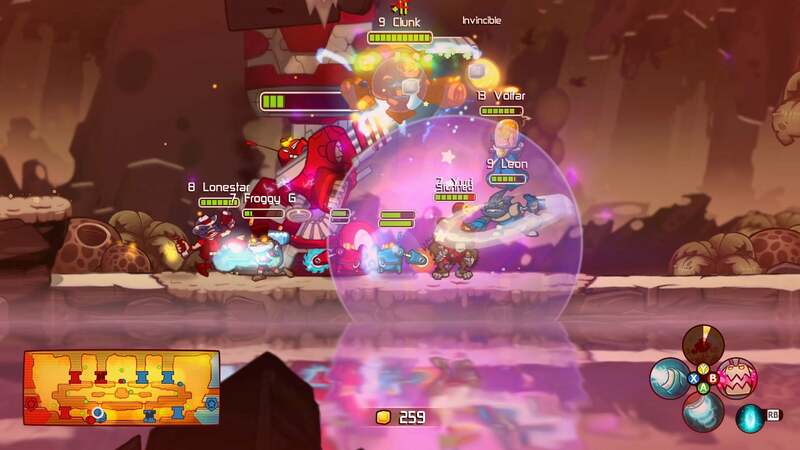 Players won’t take long to realise that playing Awesomenauts isn’t about charging around the map hoping to pick up as many kills as possible. Teamwork is vital to your chances of winning. Try to take a lone wolf approach and you'll all-too-often find yourself spawning back at your base with no Solar to spend. Knowing when to retreat is equally as important as knowing when to attack, as dying leaves you with a short waiting time before respawning, along with gifting your opponent with a nice wedge of Solar to spend. Should you need a quick health boost at any time, areas slightly away from the battle can be found where AI controlled “Creeps” can be easily killed in exchange for a quick burst of health. There’s also the ability to teleport back to your base where you will be given instant health, along with the option to spend Solar on more upgrades. Teleporting does come with its drawbacks though: it takes a few seconds to actually move and, if you try to teleport from somewhere that isn't safe, you'll gift your opponents with an easy kill. Co-ordinating attacks on enemy turrets whilst defending your own isn’t an easy task in the midst of all the action, and matches can quickly switch from a winning position to a loss if your team becomes too aggressive. Only three maps shipped with the game and these become repetitive over time. Each one provides an upper and lower level giving you two possible routes to take. Being relatively small, it’s not uncommon for mass battles consisting of all six players and added AI drones to break out, which may sound worrying considering the games 2D style. However, it’s a testament to the game’s design that the action remains coherent and clear throughout. Each match can last anywhere from around 15 minutes and upwards, depending on the skill of the players involved. 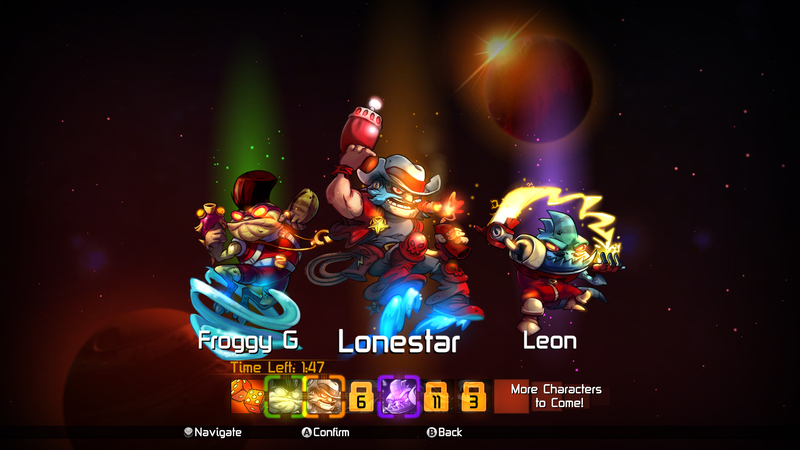 Add to that the ranking and unlock system, along with the time it takes to learn the game’s strategies and character abilities, and you’ll quickly realise that Awesomenauts isn’t something that you can jump straight into without suffering with a few moments of rage. All matches are based on the same game mode, but there are three options for you to choose from when starting a new game: Online, Private and Practice, all of which offer three-player split-screen. AI controlled characters will fill any missing spots if needed, and whilst they aren’t totally useless, you'll soon realise that, without the coordination of real players, the game can be an uphill struggle. Matchmaking, host migration and the ability for new players to seamlessly replace AI controlled characters are all brilliantly done. In the 12 hours I’ve put into the game so far, I’ve had no issues connecting to games and experienced no lag. The only drawback I would note is that you will occasionally be dropped into a game where your team is virtually defeated, and with no Solar to purchase upgrades, the chances are you’ll spend an annoying few minutes being killed as soon as you reach the action. For the achievement hunters out there, this isn’t a game that you can expect to 100% in a few hours. The majority of the achievements will all come naturally through playing the game as you aim for the Master of the Universe achievement ,which requires you to reach rank 45. Judging from my progress so far, I estimate this could take around 20 hours if played without boosting. One achievement that may cause some difficulty requires you to win an online match with 2 friends in split screen. This can be done in a private match if you have enough controllers to hand. 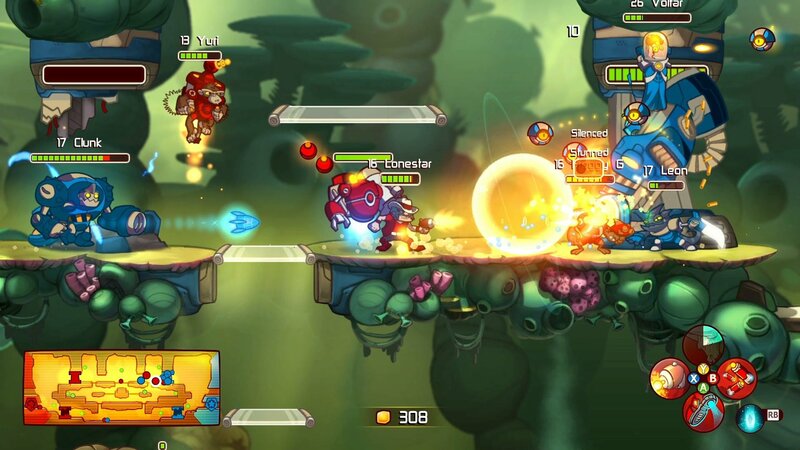 Awesomenauts provides a very fun, in-depth experience that will reward players who are willing to put time and effort into learning the different character abilities and game strategies. The very nature of the game means that there will be a steep learning curve that will often infuriate as much as it gives enjoyment at the start, but stick with it and you'll definitely get your money's worth. The game is well designed and the mechanics work very well, but it may lack replay value for some due to the current lack of maps and characters. More characters are already noted as "Coming soon" in the character choice screen, but how much longetivity they will add remains to be seen.